Chase The Wild Goose Hostel is a family owned and personally managed hostel, located at Banavie, close to the Caledonian Canal, a location with amazing views of Ben Nevis and just a little outside Fort William city centre. The Lochy Bar, Moorings Hotel and Bistro are short walk away for meals and refreshments after a long day on the hill or touring the Scottish Highlands. Guests may opt for Continental BREAKFAST and free wi-fi is available. Banavie Train Station is just 200 metres away. Recently refurbished, the Hostel has 42 beds in a mix of double, twin, family and dormitory accommodation, providing for the needs of individuals, families, backpackers and small groups. There is a self-catering kitchen should you want to cook your own meals, but you can also enjoy our Continental Breakfast. Being a little out of town we hope to offer a better nights sleep before your energetic day on the hills than perhaps you might receive in a city centre establishment. Our Guests - The hostel is also a popular stop-over for enthusiasts on the 3-peaks challenge, walkers of the Great Glen Way and West Highland Way and caters for visitors to the Mountain Bike challenges nearby, water sports enthusiasts and can even organize a mountain guide to take you up Ben Nevis. Backpackers from around the globe have enjoyed their stay. Ben Nevis - To top all this, the area is renowned for having the best views of Ben Nevis, the highest mountain in the UK. Come and experience this amazing place...! 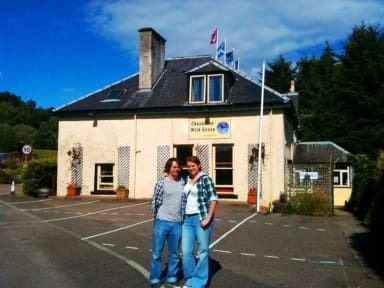 Our testimonials show us to be one of the best hostels near Ben Nevis. Please Note: Guests may choose to reserve accommodation on a competitive, discounted ‘non-refundable’ basis; alternatively guests will be charged 50% of the balance due once booked and this is non-refundable. The total balance due will be charged automatically 14 days before arrival. Non-payment will result in cancellation, so card details must be kept up to date. Groups of 8 or more guests - full payment is required 28 days prior to Arrival. If you are unable to arrive when Reception is open (between 17:00 hrs and 22:00 hrs) you MUST phone to pre-arrange your Arrival with staff. A small fee may apply per guest arriving outside Reception hours. For reasons of guest safety and security Arrivals after 23:00 hrs will be STRICTLY denied. Our hostel carpark is small and operates on a first come basis, but there is a public carpark and street parking 50m away. The lead booker will be required to provide Photo ID matching the name on the booking, to gain access. Check in open 17:00 hrs 22:00 hrs. Under 18s must have adult supervision. We regret children under 5 are not accepted. This is a non-smoking hostel. I was in Fort William for a conference and I really enjoyed my 7 days stay in the hostel. The kitchen has everything you need and it is also a perfect place to start some walks around Fort William. I really recommend it! Very nice facilities, kitchen was huge, dining room had lots of seating, and the bathrooms were clean. The beds were comfortable, and the area is very quiet. Only complaint was they were too booked up for me to stay longer. Would definitely recommend, and stay here again. Really great hostel. Great vibe, handy location near Neptune's Staircase, with parking close to fort William but far enough away to enjoy the region. Staff were friendly and helpful, rooms had a cool name system and safety entry. Would definitely be keen to stay back here again . Good hostel, but drying room is small, dining room is far from kitchen and there could be more toilets. Well-equipped, friendly little hostel just outside Fort William. Right by the Caledonian Canal’s five lock system “Neptune’s Staircase”. Good value DIY breakfast and a couple of pubs nearby if you want to eat out. Only stayed one night before a hiking trip. Hostel was great, staff were friendly and the hostel is only 4 or 5 minutes walk from the station and only a few minutes on the train in to fort william. The hostel is a little harder to reach with public transportation than expected, especially when trains were cancelled due to bad weather and we had to rely on busses. Nevertheless, it is probably a great base for people who have a car to explore Scotland with. The kitchens and showers stood out positively, as both seemed recently refurbished and very modern. It was further from Ben Nevis then what was expected. The bathroom set up was horrible, the fans were clogged with dirt. The beds were very uncomfortable. For the one night we stayed and the price it was fine but I wouldn’t stay again.